Our new aviation battery specific 2016 line of BatteryMINDer® battery chargers-maintainers-desulfators are the most advanced we have ever produced. 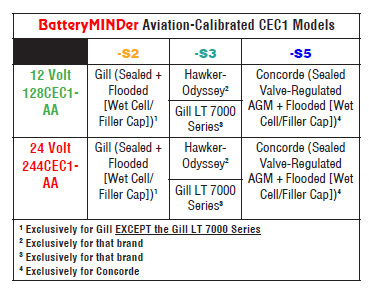 In addition to charging and maintaining all 12V Concorde® sealed or wet cell (filler caps) aviation batteries users can now determine the level of charge remaining in their battery, and if weak and in need of replacement, before going bad. Units test for weak/dead cells and will recover weak or severely discharged batteries that other chargers would reject. Known as the CEC1-AA series they feature advancements in easy to understand battery analysis and condition not previously available in any other single model. Their high efficiency design, controlled by industrially-rated microprocessors, allow continuous operation (24 hrs./day) for less than $0.43/month*. Temperature sensors prevents over/under charging from freezing to 130-F. These chargers-maintainers-desulfators are designed for all size and type 12-Volt Concorde® Aviation Batteries. If you want the longest possible life and performance from your batteries there is no other product better at doing just this and BatteryMINDer® Guarantees it! As aircraft owners, we want the best for our machines. However, often times the "best" cost big money. Here is a product that for not too much investment can pay one back in the form of longer battery life and guaranteed starts even after periods of non-use. I appreciate the fact that it's microprocessor controlled and will not overcharge my battery so it's safe to leave connected and charging indefinitely. None of us want to return to a hangar fire or boiled over batteries. It gets really cold in the northeast and this product will charge, maintain and run a desulfurization regimen automatically that prolongs the life and utility of my very expensive Concorde battery so I can start up and fly confidently. The status lights provide a much better insight on the condition of the battery and the function of the BatteryMinder. Just bought two, one 12 and one 24 volt for my airplanes. They were recommended by all my hangar mates. I don't fly as often as I should, so this hopefully will help lengthen the battery replacement cycle. Lots of information on the device panel and it boots and starts working very fast. This line of battery chargers eliminates the worry of damaging your battery by using the wrong charger. The desulfurization mode is a feature that most of us overlook. Click the button below to add the BatteryMINDer® Model 128CEC1-AA-S5: 12V 8 AMP CONCORDE® Aviation Battery Charger-Maintainer-Desulfator to your wish list.